For some people Summer is a time for lounging around the pool, hanging out at the beach, or getting asymetrically sun-burnt because either they did not apply the sunscreen evenly or they fell asleep in the sun. However if you are like us, napping by the pool is not your thing. Even when we are out “relaxing,” we are optimizing our down time with a stimulating read. If you are like us, then you will surely be interested in our Summer reading list. We RainyDayPhotographers are always looking for something new to try. The recently released Painting with Light from Rocky Nook looks to be a great source of inspiration. The warmer Summer nights will be the perfect time to try some of the ideas in the book. We have recently upgraded to iMovie and iPhoto ’11 but have not yet explored the newer features of these applications. 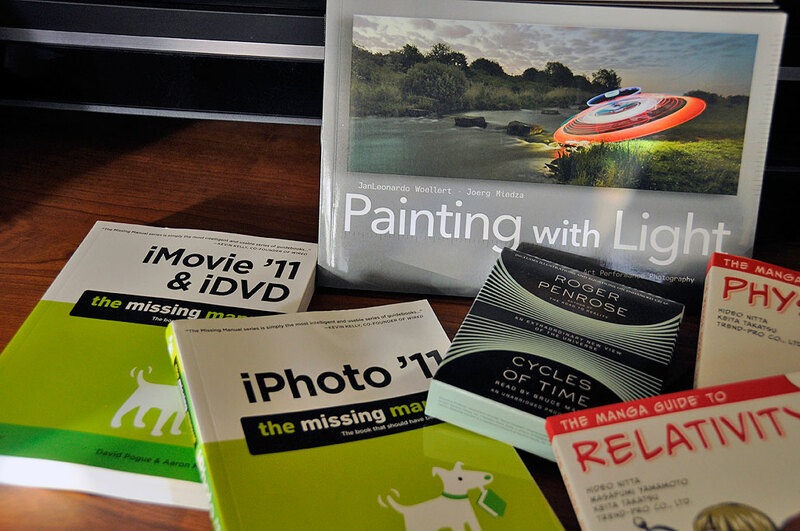 We are confident that we can quickly and painlessly come up to speed with help from The Missing Manual series (iPhoto ’11 , iMovie ’11 ) from O’Reilly. Of course, we are not just work, work, work. Like everyone else, we enjoy a bit of fun as long as it also comes with a helping of mental stimulation. For both (fun and etc…), the Manga Guides have always delivered. Their two new offerings, Physics and Relativity , are on the top of our reading list. We have already finished the Manga Guide to Relativity…we picked it up, started reading it, and didn’t put it down until it was done. It was THAT good! For our road trips, Roger Penrose’s Cycle of Time has already been loaded onto our iPod and will keep us company for at least seven hours. BTW, some of us like listening to audio books so much that they have been known to just drive around without an actual destination in mind….shhhh. However, with today’s gas prices, their gas expense reports are going to get a little closer scrutiny. Now that we are done experimenting with the Adobe’s iPad Publishing tools, it is time to get serious and get back to learning more about programming the iPhone and iPad using XCode. 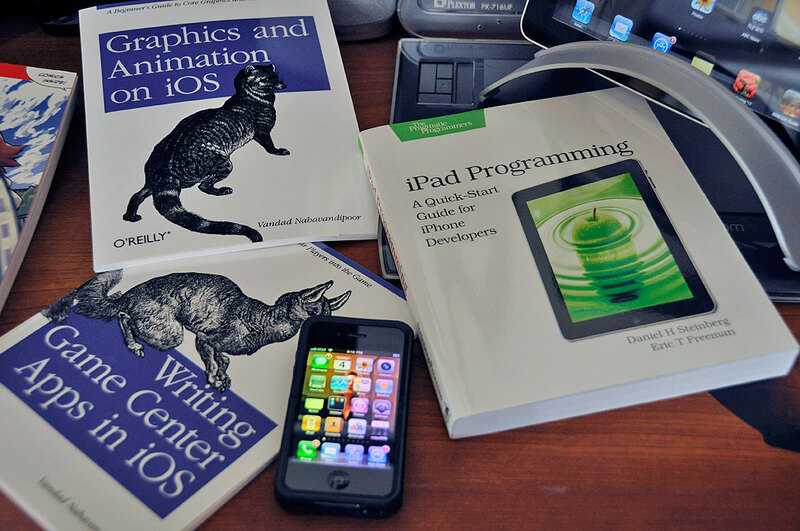 To help with that, we will be taking a look at two of O’Reilly’s just released guides on programming the iOS. The Graphics and Animation on iOS is a step-by-step guide with code samples that can we can immediately put to work in our iPhone and iPad apps. Like may others, we are happy for and envious of the Angry Birds folks for hitting it big with their game. Game playing is a huge market for the iPhone and iPad. Game programmers looking to integrate advance features such as user authentication, multi-player capabilities, and other GameKit technologies into their apps should definitely check out Writing Game Center Apps in iOS . We know we will. Yes, bigger is better. If you want to transition some of your iPhone skills to a larger device, then iPad Programming by Steinberg and Freeman will help you leverage what you know about the small screen to the larger 1024×768 form factor. However, programming for the iPad is not just about making things bigger. This book will show you how to make it better. By the end of the Summer, you can have a great tan or you can have a better understanding of the Universe, have written the next Angry Birds, and got it running on both the iPhone AND iPad. The choice is yours.